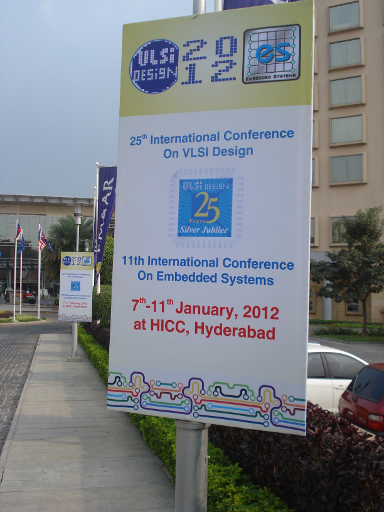 I attended the 25th International Conference on VLSI Design and 11th International Conference on Embedded Systems between January 7-11, 2012 at the Hyderabad International Convention Centre, Hyderabad, India. The first two days consisted of tutorial sessions, and the next three days had the conference presentations. There were also exhibit stalls from different companies. On the first day I attended the tutorial session on SystemC AMS extensions by Markus Damm, Sumit Adhikari, and François Pecheux. Chitlesh Goorah had earlier tried to get SystemC into Fedora and Fedora Electronic Lab, but, due to licensing issues it could not be included. SystemC-AMS is now released under Apache license. Open SystemC Initiative and Accellera Unite have now integrated to become Accellera Systems Initiative. We hope to work with them to get their sources under a single free/open source software license. François Pecheux is from Laboratoire d’Informatique de Paris 6, Pierre & Marie Curie University (UPMC), Paris, France, and we already ship their free/open source EDA tools in Fedora. On day two, I attended the tutorial session by Sridhar Arvind on 3D-ICE, a free/open source interlayer cooling emulator from Embedded System Laboratory, Ecole polytechnique fédérale de Lausanne, Switzerland. I have already been working with Sridhar, Prof. David Atienza and Alessandro Vincenzi on testing 3D-ICE on Fedora. I had built and tested the dependency SuperLU library and the 3D-ICE package before the tutorial session. Their software has already been downloaded by over 70 research labs around the world. I will push our tested changes to them. On the later half of the day, I attended a session on verification constraint complexity. Teal is a useful verification utility and connection library that has support for constraints and parameter control. The authors of the tool had agreed to release it as free/open source software, and we also ship it in Fedora. On the following three days of the conference, I attended various paper presentations from different tracks from reconfigurable architectures to methods in AMS optimization. I met Prof. Susmita Sur-Kolay from the Indian Statistical Institute, Kolkata, India where they run Fedora in their labs. They also wished to use the 3D-ICE tool and GPU tools in their labs. I also visited the exhibit stalls meeting different people from the industry and academia. There are quite a few interesting free/open source tools that users can benefit from, and we will work in making them available in Fedora. In 2013, the conference will be held in Pune. Thanks to Red Hat for sponsoring my travel and participation at the conference.